To a golfer, other than “shank,” “choke” is the most detested word in the English language. It’s that terrible state of mind that robs players of their touch, their swing and seemingly their mental prowess. 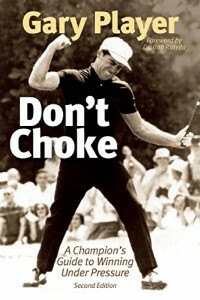 Nine time major champion Gary Player knows about all the possible ways a golfer can “mess up” and in the second edition of Don’t Choke: A Champion’s Guide to Winning Under Pressure he offers his advice of how to cope and indeed win in competitive situations in golf, business and life in general. Younger persons may only have a vague idea of the peripatetic Player and what they do know coming mostly from his appearances promoting his ideas on what to eat and staying in shape. Chapters describe his experiences and thinking while winning his majors on the regular Tour plus his nine majors on the Senior/Champions Tour. Most revealing are his accounts of how he controlled his emotions or at least attempted to control them. Player then goes further, taking what he learned in the pressure cooker of championship golf and applying it to his personal life. Additionally the application of these principles in business helped Player in his very successful golf course design company plus several other endeavors. Player is enthusiastic, intense and some say even a little over the top in person and those characteristics certainly come across in his book as he promotes his philosophy of physical fitness, nutrition and life. Sports psychologist Dr. Bob Rotella, author of the classic Golf Is Not A Game Of Perfect, wrote the forward citing Player’s insights as vital to winning as a super-hot putter. However, perhaps the important thing to take away from reading Don’t Choke is no matter how well you control yourself and play the shots it’s still good to remember it’s possible someone can still beat you. The real challenge is not to beat yourself.